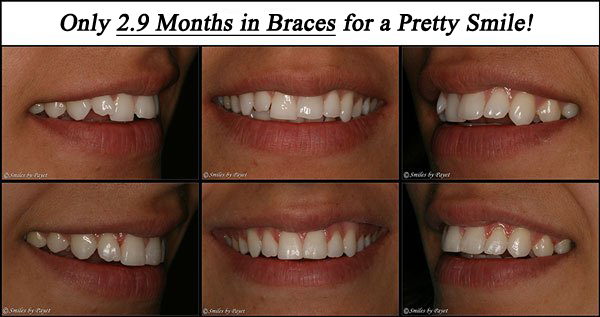 People often have difficulty believing that we can really move teeth to create a more beautiful smile in only 6 months. 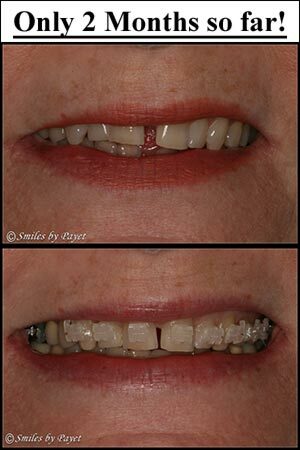 Here’s a case to show just how well it works – Lynn has only had her almost invisible braces on for 2 months, and look how far the gap between her front teeth has closed already! 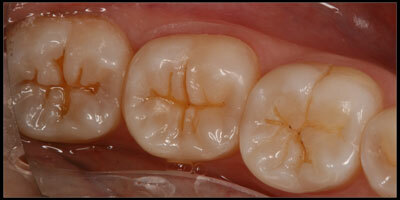 When most people think of “bonding,” they are thinking of tooth-colored dental fillings, or composite fillings. To be completely technical for a moment (I try to avoid that as much as possible to not bore you 😉 ), “bonding” is actually the series of steps and the products we dentists use to make the tooth-colored fillings actually STICK to the teeth. OK – technical moment is over. Whew, aren’t you glad of that? An issue that many patients have experienced in the past, is that their new tooth-colored fillings seem to be mildly or even extremely sensitive to cold, and sometimes hot, foods and drinks, even just to tapping your teeth together. Naturally, it’s not a fun experience, and one that all conscientious dentists try to avoid for their patients, but even in 2009, when one would imagine there is a solution, many patients still run into this problem. Here’s the thing, though……..THERE IS A SOLUTION! OK, you’re probably asking, if there’s a solution, why is it still a problem? Well, it’s simply a matter of technique, really, and getting the technique for bonding is actually more difficult than it might seem to be. In addition, just as in the rest of the world, there are MANY bonding products that dentists can use when doing tooth-colored fillings, but just because the companies that produce them supposedly have research behind these products, they’re not all they’re always promised to be. Some work better than others in strength, sensitivity, durability…..and it can honestly be rather tough to sort through all the stuff that companies throw at us, just like for physicians with all the stuff pharmaceutical companies throw at them. So it is CRITICAL that dentists really stay up on the latest research, but here’s the thing…..just because something has the “latest and greatest, newest and most improved,” labels all over it, that doesn’t mean it actually works as well as the old stuff all the time. There’s one other REALLY CRITICAL FACTOR for long-term success of composite fillings, and that is keeping the teeth DRY while the bonding is placed and activated, then the filling material is layered into the tooth. Saliva contamination is one of the most common reasons for bonded fillings to be sensitive, and it’s also one of the most common reasons bonded composite fillings fail earlier than they should. There are a couple techniques dentists can and SHOULD use to do this – a Rubber Dam or something like the Isolite2 Dryfield Illuminator system. Both are pretty inexpensive for the dentist to have (we have both and use them as appropriate), both are pretty easy to use, and to tell the honest truth, they actually make it EASIER for us to complete your dental work faster and with better results. I really don’t know why not all dentists use 1 or the other; I can’t imagine practicing without them, ’cause it’s a lot harder to get good fillings! So there you go: 2 of the most common reasons why bonded, tooth-colored, composite fillings are often sensitive to hot and cold foods/liquids or even just tapping your teeth together. The good news in our office? I’m fortunate to actually know the man who basically INVENTED bonding, and I not only use the techniques he teaches, but I even use the most current materials that he himself has developed and/or recommends, and I can honestly say that ALMOST NOONE who gets tooth-colored fillings in my office ever has hot/cold sensitivity afterwards. There are rare exceptions, ’cause I’m not going to claim perfection, but they’re quite rare indeed. 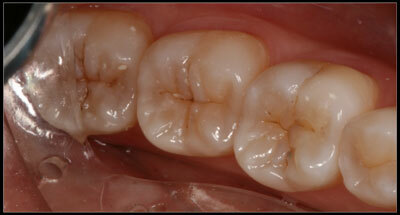 Teeth after small cavities were cleaned out with very small preps, possible because of the dental microscope. Teeth after very small tooth-colored fillings were done, possible because of the dental microscope.